It seems like far too long since I reviewed any brushes from eBay, so today I thought I'd correct that and share a round up of my latest eBay makeup brush buys. These are all incredibly affordable with most of the brushes costing only £1-2, but feeling much more expensive! This was a set I was excited to receive as they looked amazing in the listing and like no other brushes I'd seen! When they arrived I was instantly impressed, by both the look of them (the swoon-worth textured handles!) and the quality - no chipped coating and ultra soft bristles! In the set you receive 3 face brushes - a foundation brush, angled brush and a blusher/powder brush, along with 4 eye/concealer brushes - a fluffy blending brush. flat lid brush, 2 smaller blending brushes and a pointed crease brush. The are slightly shorter in length than most standard brushes, making them ideal to travel with or just everyday brushes! Out of all the brushes in the set I definitely don't have a least favourite, okay maybe the foundation brush, not because I don't like... it but because I have others that do a better job. But all round I've been impressed with every single one, especially the eye brushes. Expect minimal shedding and fibres that keep their shape after being washed. I still can't get over how pretty the handle of these look and how all round lovely they are! P.S. Also available in gold in the listing. A set of MAC dupe eyeshadow brushes now... for only £1.50, like whaaa!! Seriously I don't know what else you could buy for that price... in fact that's the same price as I paid recently for a bottled drink from a service station! Now I should probably go into detail about which brush is a dupe for what MAC brush, but I only own a single MAC eyeshadow brush, so I can't. However I know what the bristles are like to I'm comparing against that and can say they are definitely dupe brushes. You see the bristle are soft but slightly wiry looking and the shape of them very much reminds me of MAC brushes and are ideal for blending with. You receive 3 natural looking eyeshadow brushes and a single slightly larger black fluffy blending brush. I've been using all the brushes equal amounts and I like them all as additional blending brushes. I find the black bristled brush ideal for translucent powder to prime the lid and to blend out harsh edges, I also love the middle sized brush as a crease brush. I do have a feeling these may become more splayed out over time and they is some shedding but for only £1.42 you can't complain. In fact if in a few months these are looking a little lack lustre I will be buying some more! On to a dupe for a Real Techniques blending kabuki which would normally cost around £9.00... so I nice little saving. 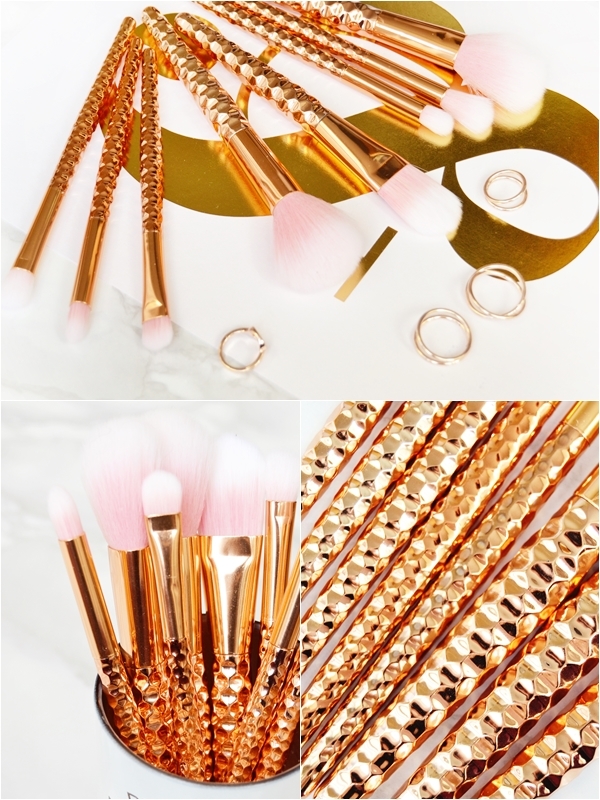 Of course some of you may not like buying these kind of non-branded 'dupe' brushes, however I personally like to try them out and have always found them to be really good quality compared to actual fake brushes that scrimp on quality to produce the extra packaging and including the logos. Other than this brush being an excellent dupe for one of the RT brushes I really cannot get over just how soft the bristles are. It's one of those that you literally sit there brushing over your face until you snap out of it and wonder what you were doing - it's THAT soft. This works exceptionally well with liquid foundations and creates that flawless finish to the skin. Also could be used with cream products as well. Just a lovely lovely brush here. You can also find the matching 6 piece set including this brush for only £3.54 here - what a bargain! Lastly a little impulse buy, just because I liked the look of it... I definitely don't need any more blusher brushes, but oh well! 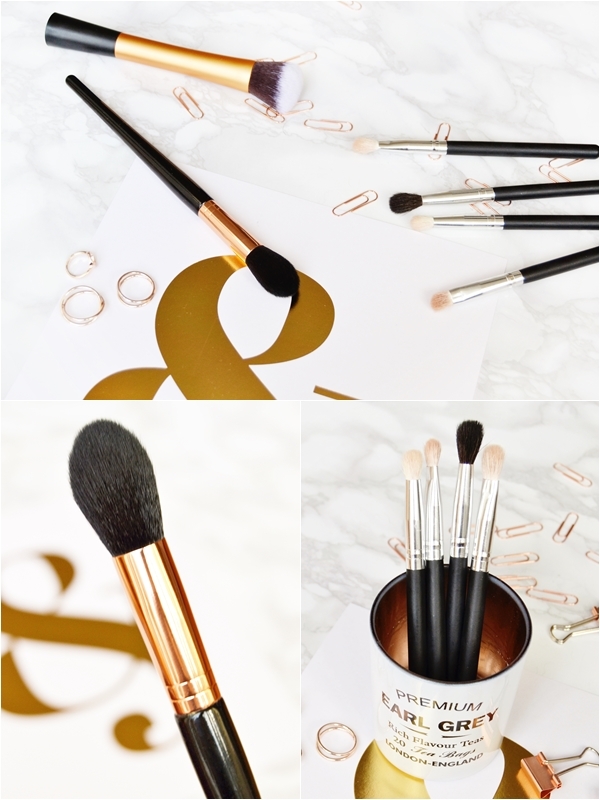 From the tapered handle, to the rose gold ferrule and the perfectly domed shape, I can't get enough of this brush - it's unlike anything else in my brush collection. With the long tapered handle I've found this can be held further down, achieving the most perfect application with no risk of Aunt Sally-esque cheeks! I've only used this with powder blush so far but already I want a few more to use with my favourite blushes, yes I love it that much! So very impressed with this brush! With so many lovely brushes here I hope you've found something to treat yourself to!